Is your family's favorite couch faded or torn? European Leather Repair has specialized in the cleaning, repair and restoration of fine leathers since 1981. European Leather Repair has the solution to YOUR leather problem! Every leather repair or treatment that European Leather Repair undertakes get's our complete and thorough attention to detail. The quality and life span are the best in the business. Guaranteed! Is your family\'s favorite couch faded or torn? Every leather repair or treatment that European Leather Repair undertakes get\'s our complete and thorough attention to detail. The quality and life span are the best in the business. Guaranteed! First and foremost, we promise you – We Know What We Are Doing! 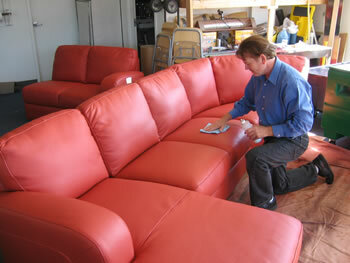 There are lots of players in the leather furniture and leather garment arena. However, we can say quite proudly that we actually DID get our knowledge and experience in Europe over several years, in a little town far away called Munich, Germany. We even did jobs for the very exacting and demanding German Leather Museum! The Leather Has Been Damaged!